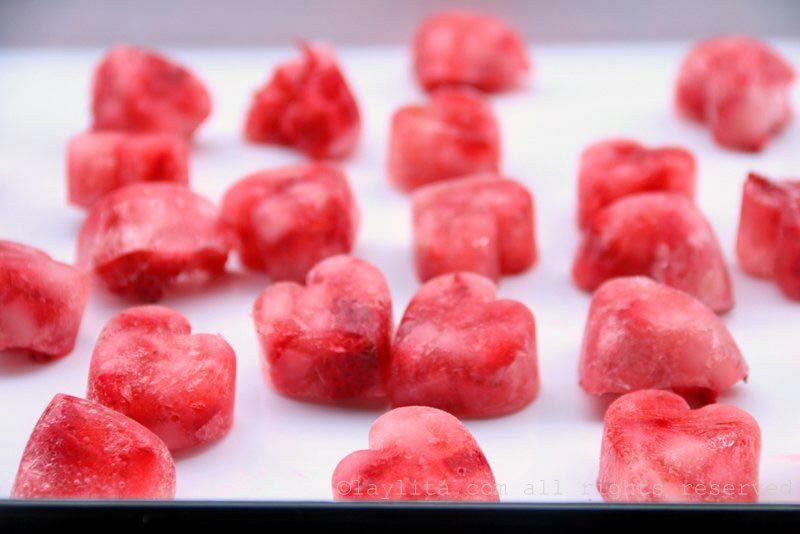 These easy to make champagne and strawberry ice cubes are another one of my fun ice cube ideas. 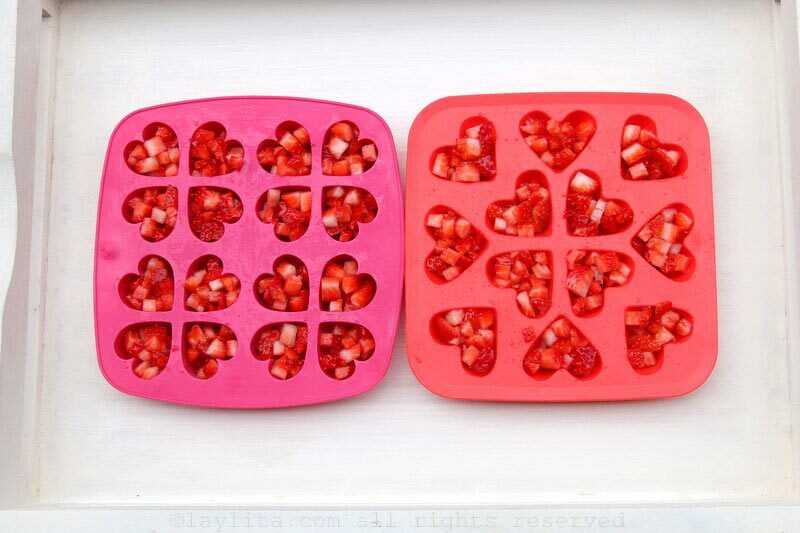 And maybe also the result of owning more cool shaped ice cube trays than I need. 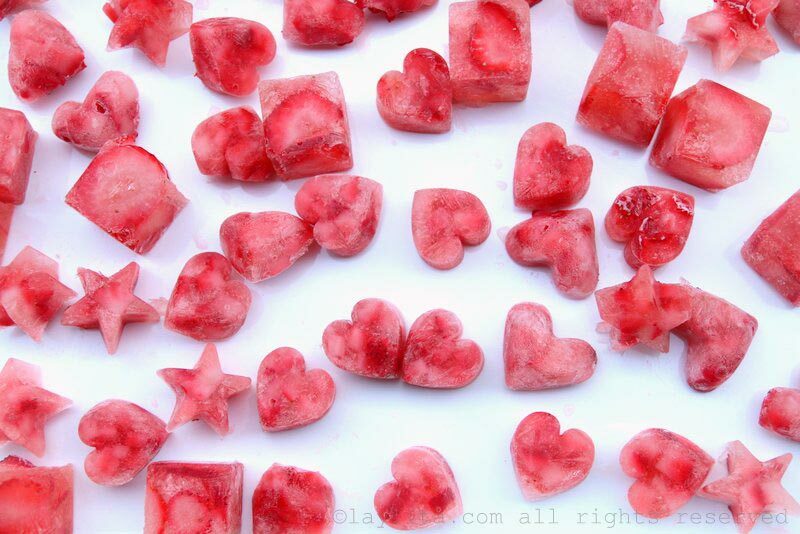 Plus, I love champagne or any bubbly sparkling wine. 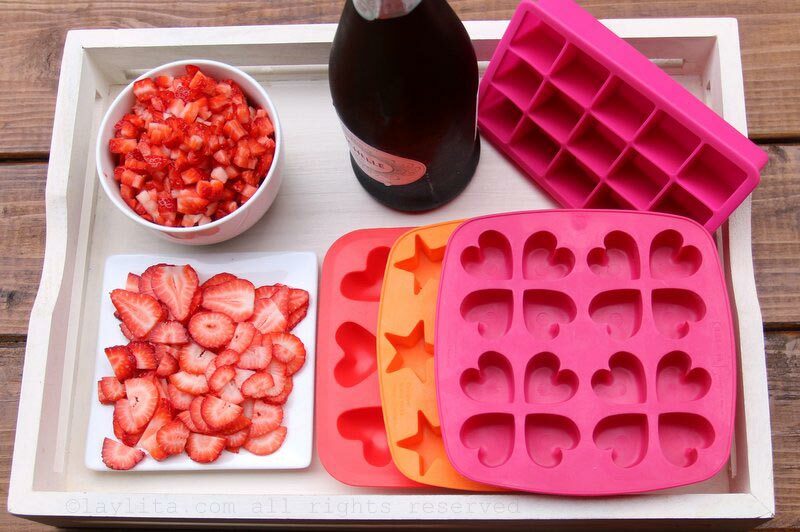 Champagne and strawberries are a perfect combination for these ice cubes. 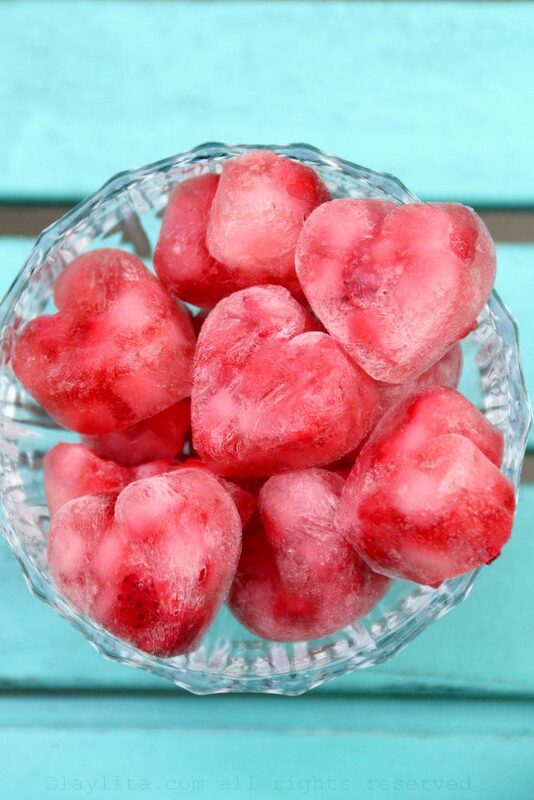 You can make them using regular square or rectangle shaped ice cubes, or make use of those heart/star/igloo/fish/diamond/etc shaped trays that (like me) you bought a while ago and always forget to use. 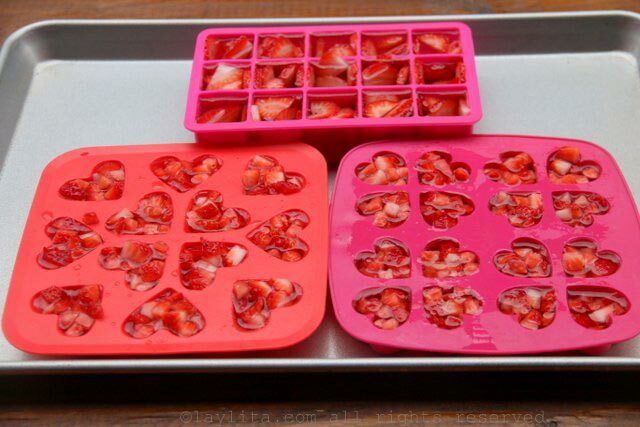 Fill the ice cube trays with the diced or sliced strawberries. 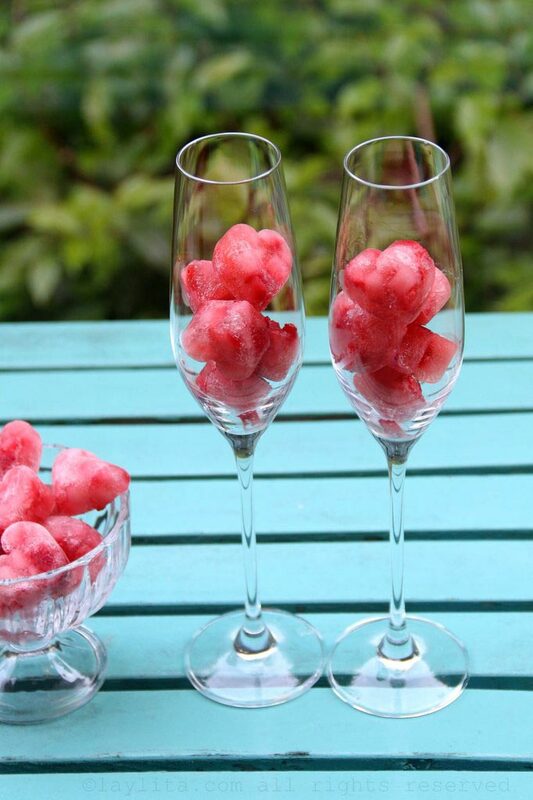 Carefully pour the sparkling wine over the fruit into the trays. 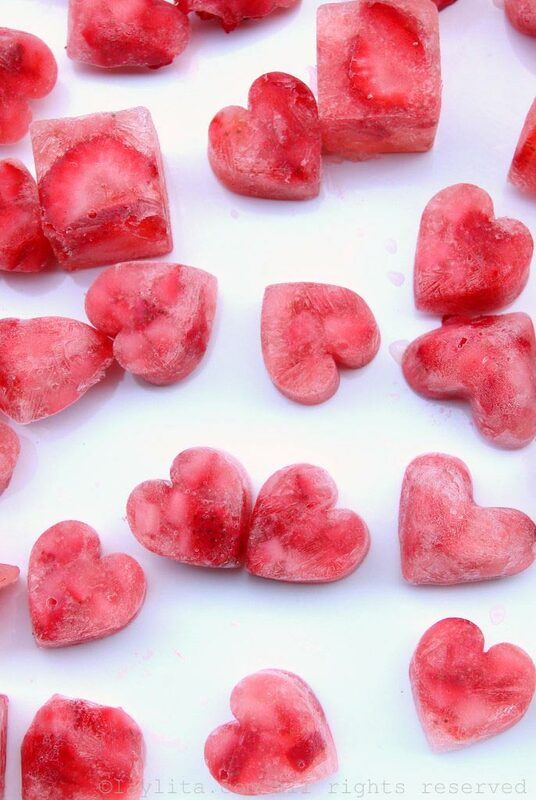 Freeze for about 4-6 hours or until solid enough to remove (exact time will vary based on the temperature of your freezer). 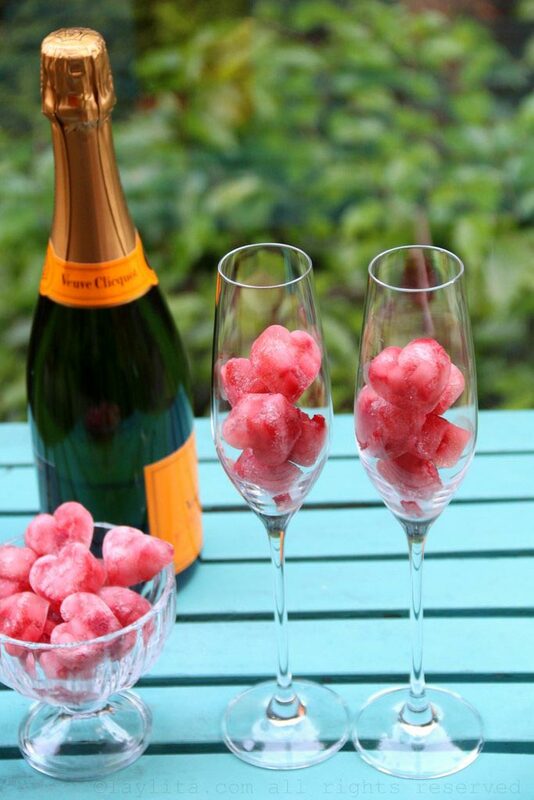 The champagne ice cubes will not freeze 100% the way water would, but should be solid enough to remove and use in drinks. 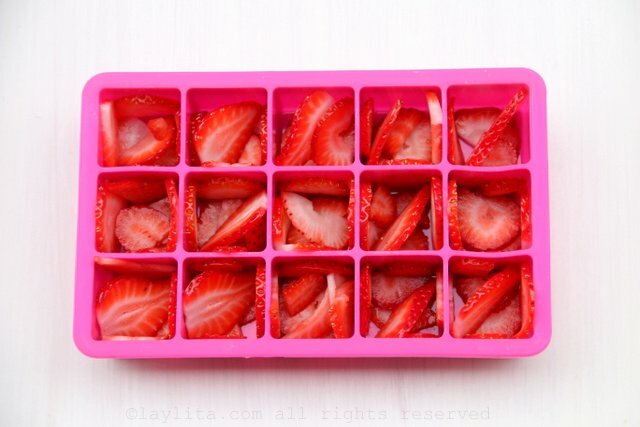 – Add them to a glass of champagne or bubbly, it will help keep it cold without watering it down and also add a touch of strawberry flavor and color. 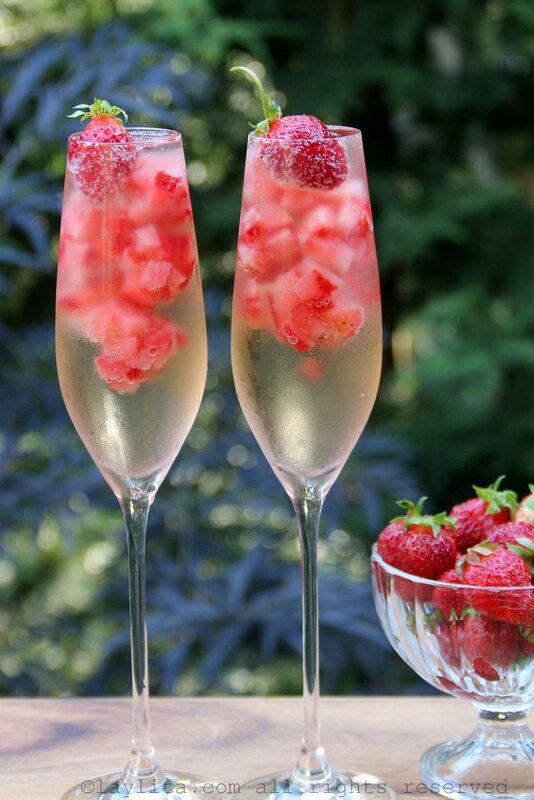 – Add them to sparkling wine cocktails; they make a great addition to cocktails like berry mimosas to sparkling wine punch or a moscato strawberry sangria. 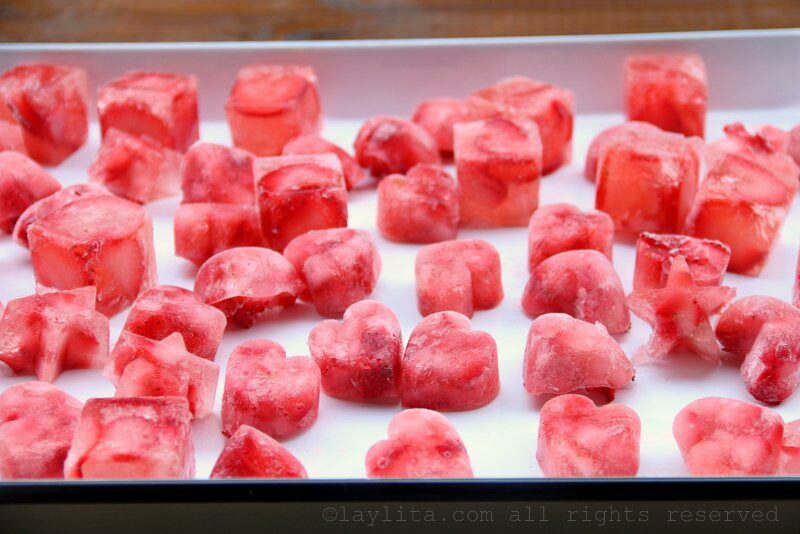 These sparkling strawberry ice cubes can be made using any type of sparkling wine that you prefer, from champagne, cava, prosecco, brut, or also sweet wines like moscato or riesling. 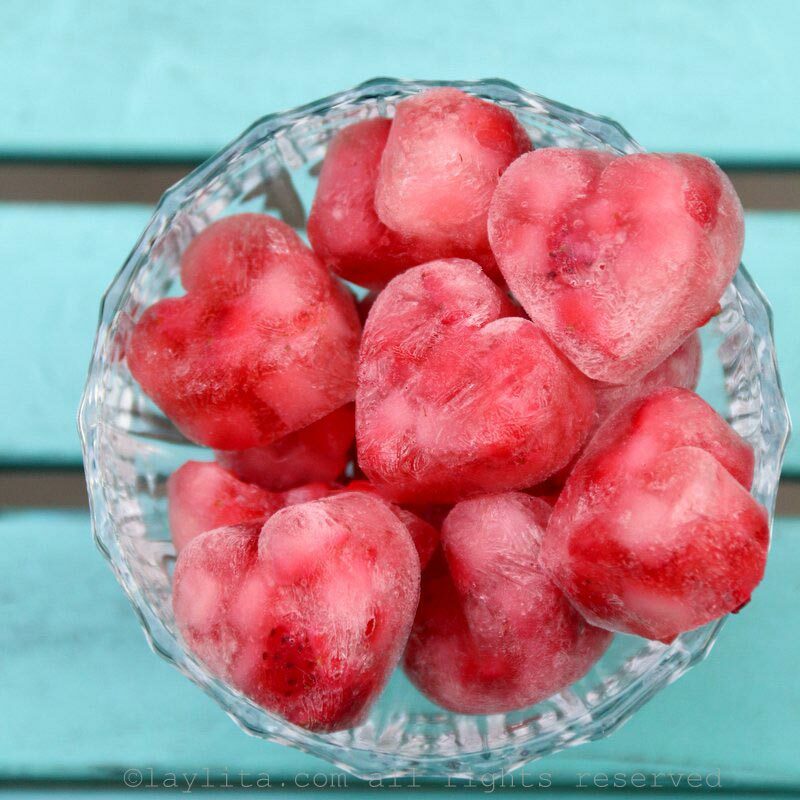 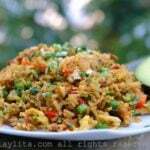 They usually take about 6 hours to freeze, but it might vary depending on your freezer temperature. 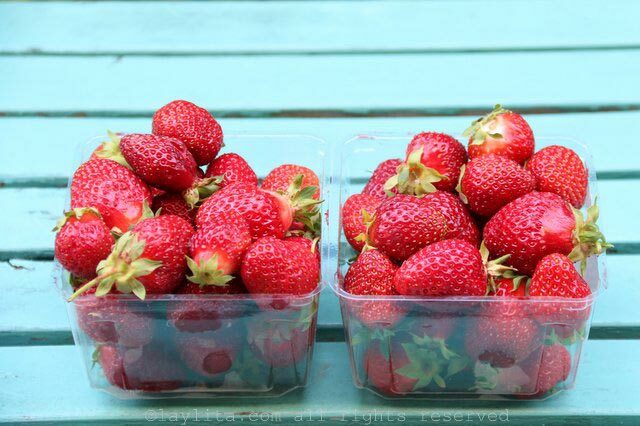 What a fantastic idea!! 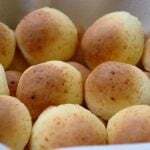 You are full of party tricks my friend!